Feature in March 2019 Print Issue ! Monty Hill’s WORLDS ONLY V-8 Top Fuel Suzuki …Feature shot by ECS Anthony Langston Sr aka Doughboy ! Feature In January 2019 Print Issue ! Feature in Fall 2018 Print Issue ! John Davis’s Tokyo Dream Nissan 350Z …Feature shot by ECS Mark Mckeehan ! Welcome To One Of The Forefathers Of The Car Show Industry Founded in Feb 2001 ..... A Online and Print Publication That Has " Proven To Post Coverage First " Numerous times throughout the years ! It was created as a all Lowrider website back in the earlier days then a few short years later in early 2003 slowly became another chapter in the online magazine world ! It didn't take long to pick up on all the love we were receiving from the show scene along with strong encouragement from my fellow homies over at Drop Jaw.... We were on the road from there ! Now years later Anthony is still with us and has never skipped a beat and is retaining his position as Lead ECS Photographer as of today ! 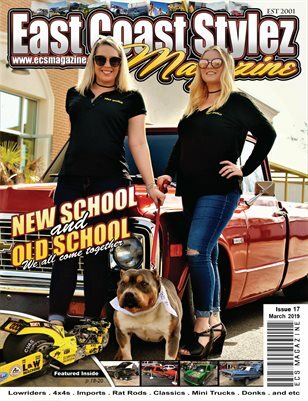 Over 18 yrs now www.ecsmagazine.com has been around and Going To Car shows of many different types and we will be still here many more years from now !